Comedy Masala ft. RIZAL VAN GEYZEL (MAL) | as seen on Comedy Central | EVE of PH Show!! Known for his comedic presence that lands somewhere between the profound and the absurd. 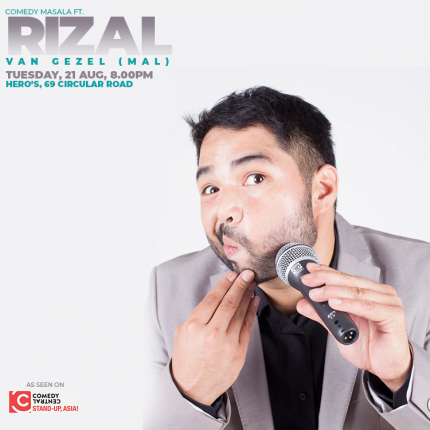 Rizal Van Geyzel has been praised as “the future of Malaysian stand-up comedy”. His special brand of humor touches – with gentle and sometimes not-so-gentle jabs – on personal topics as well as observations on Malaysian life. Rizal is a modest yet idealistic young man of Malay, Chinese, Turkish and Dutch descent. His mixed descent and upbringing gives him the insight and perspective to poke fun of the various quirks of multicultural Malaysia, ultimately reminding us that race alone does not define the human spirit.